Indore, according to the rankings released by the Ministry of Urban Development on May 4, is the cleanest city in the country. This is despite the absence of a solid waste processing facility or waste segregation at source in the city. Indore is not an aberration; most of the top 50 cities featured in the Swachh Survekshan rankings share a similar story. Worse, cities with good waste management practices feature really low in the annual rankings. “The ranking of some of the cities surprises me because I have visited them and they do not have much to show except that there is no litter on the streets,” says Bharati Chaturvedi of environmental non-profit Chintan. Experts say flawed parameters have marred the rankings. The government invited 500 cities that are enrolled under the AMRUT scheme to participate in the rankings, of which 434 participated. AMRUT was launched in June 2015 to establish the infrastructure that will ensure robust sewerage networks and water supply for urban transformation. In last year’s survey, only 73 cities were ranked. The ranking awards weightage on the basis of six heads: municipal solid waste collection and transportation (40 per cent weightage), processing and disposal (20 per cent weightage), condition of public and community toilets, and open defecation (30 per cent weightage), and capcity building and behaviour change (10 per cent weightage). The cities have been marked on a scale of 2,000 points, of which 900 points have been allocated on the basis of answers submitted by the municipal bodies. Another 500 points have been allocated to be awarded by a team of assessors who have physically inspected the cities. The remaining 600 points have been allocated to be awarded according to citizen feedback collected through telephonic conversations and through questionnaires submitted online and on a mobile application. The maximum weightage has been given to procedures for waste collection and transportation, but the parameters favour a centralised model, where emphasis is on treating waste away from source. As a result, Indore, with an effective door-to-door collection system, scored the maximum 360 points, while Bhopal, the second cleanest city, received 352 points. Meanwhile, Alleppey, which follows a decentralised system where waste segregation and processing starts at the household level, received just 91 points, which is much lower than the average score cities received under this category (224 points). Ironically, decentralised collection system is cheaper and more environment-friendly than the centralised model. Still, just five out of the top 50 cities—Pune, Suryapet, Coimbotore, Ambikapur, Mysuru—partially follow the approach. Cities that follow a centralised system spend over 70 per cent of their budget solely on collection and transportation. “Indore spends Rs 110cr a year on door-to-door waste collection,” says Asad Warsi, a consultant with the Indore Municipal Corporation. Alleppey, on the other hand, has cut down its collection and transportation cost from Rs 40 lakh per month to just Rs 40,000 by adopting a decentralised model. The centralised model also has higher carbon footprint. Bhopal, for instance, transports its waste to the lone processing site that is situated 16 km from the city. In a decentralised model, the amount of waste collected is substantially lesser, which reduces the number of trips waste trucks have to make every day. The number of trips made by municipal trucks to processing units in a day can serve as an effective parameter for the ranking. What should have been adopted : The rankings do not award points for segregation at source, which is mandatory under the Solid Waste Management Rules (SWM), 2016. All households in Alleppey segregate their waste and use the wet waste for compost. This leaves only the dry waste, which is collected on specific days of the week. Meanwhile, Indore introduced segregation at source in January this year. “It is currently practised by 10 per cent of the households,” says the SPCB official from the state. The scheme also overlooks the importance of transporting the waste in segregated compartments. In Indore, for example, the municipal trucks have separate compartments for different kinds of waste, but they still carry mixed waste. “The survey is penalising cities that are investing money in making people more responsible rather than in collection and transportation,” says M Prem, ward councillor, Alleppey municipality. Waste processing and disposal has been given 180 points, but even here the parameters favour cities which follow a centralised model and practise secondary segregation of waste, common in cities that do not have segregation at source. No wonder, the urban body in Indore scored full points for processing and disposal (180), followed by Mysuru (174) and New Delhi Municipal Corporation (133). The points awarded to Alleppey (17) and Thiruvananthapuram (8) remained low. 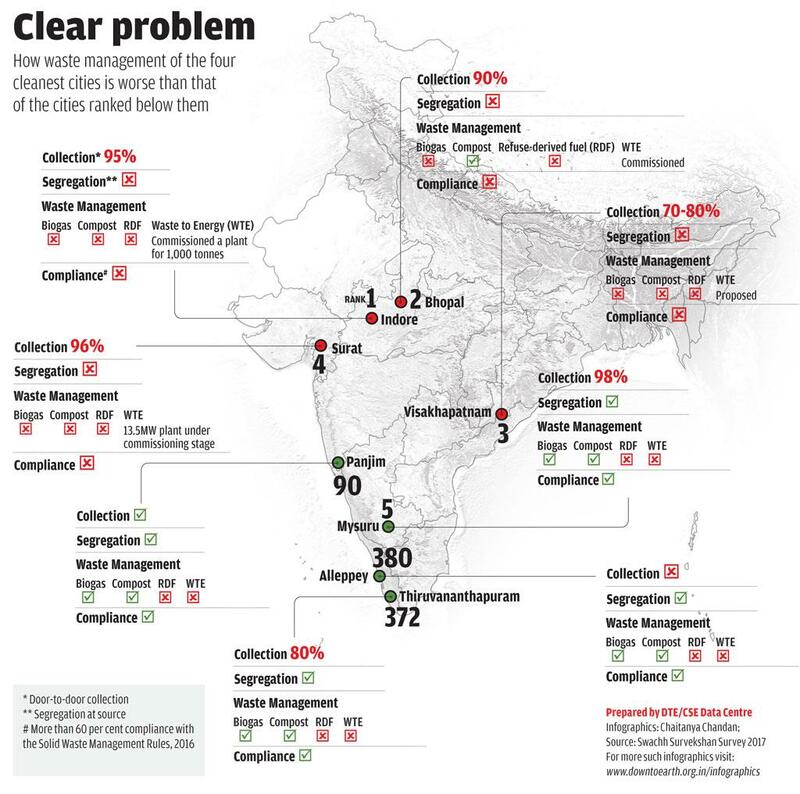 The flaw in the parameters means that Indore scores high despite not having even a single waste processing unit. The city, at present, dumps almost its entire waste—over 1,000 tonnes per day—without any treatment. It has commissioned a Waste to Energy plant with a capacity of 1,000 TPD. “As reported by the Indore Municipal Corporation, around 200 tonnes per day of the existing landfill waste is being handled by a private company. However, there is no treatment of the daily waste that is generated,” says the SPCB official. Meanwhile Panaji, which ranks 90th, received a score of 157 despite its “five-point segregation model”. Households segregate waste at source into five different categories, wet waste is composted by the Residents’ Welfare Associations and the dry recyclable waste is further segregated into 30 different categories in a Material Recovery Facility. This efficient system cost the city 23 points. “The methodology says 23 points will be awarded to cities that use plastic to make roads. But we send it to industry, which is better. We are able to do it because we segregate our waste properly,” says a senior official from the Panaji municipal corporation. In fact, not a single Kerala city features in the top 250, despite the fact that most process the wet waste at the community level. “The state is pushing for treatment at source. As a result, we have been given scores as low as 9 points for processing and disposal,” says V Nikhilesh Paliath, a local activist advocating for green protocols in the state. The ranking system favours cities that first collect mixed waste and then spend a fortune segregating and processing it at the secondary level over cities which segregate and process at the community level. What should have been adopted: The methodology should have ideally adopted a paradigm that incentivised cities with the refuse, reuse, recycle, recover and reduce approach. There is also no mention of the informal sector, which plays an important role in recycling. “Over 60 per cent of the recyclable waste is managed by the informal sector,” says Shashi Pandit, All India Kabadi Majdoor Mahasangh. The ranking system should also have discouraged the use of landfills, which is the least preferred option, according to the SWM rules. Still over 90 per cent of Indian cities with functional collection systems dispose their waste in landfills that are usually unsanitary, according to the Central Pollution Control Board. The methodology awards 90 points for capacity building and behaviour change, which is monitored by the number and size of hoardings put up to sensitise people about sanitation and by the print and digital campaigns carried out by the urban local bodies to promote sensitising programmes. While Vizag bagged 90 points, Bhopal 87 and Indore 85; cities in Kerala, which generally discourage the use of big hoardings because they cannot be reused, hardly received any points. Kozhikode and Alleppey received zero points, while Thiruvananthapuram got 1 point. Cities also expressed dissatisfaction with the way the Quality Control of India assessors carried out their job and the malfunctioning of the mobile app used by over 3.7 million citizens for feedback. “Usually a team of three assessors visited a city and they would only have enough time to go through government documents rather than go on site inspections,” says an official with the Mysuru urban local body. This is understandable because the surveys were carried out by 471 assessors who visited over 17,500 locations within January and February. “Panaji city lost points on citizen feedback because the name was changed to Goa in February and the votes were not counted,” says the official. Shibu Nair, programme director of Zero Waste at Thanal, a non-profit based in Kerala, highlights another fundamental predicament—giving cities like Indore full points in waste collection and transportation indicates that according to the government, no improvement is required. “But cities can improve on all the parameters,” says he. In fact, experts warn that the long-term impact of the rankings will be an endorsement of the unsustainable centralised waste management systems. “Cities where municipal corporations are trying to involve communities will give up because their efforts are being penalised,” says Nair. Thanks Paramasivam. I hope ULBs doing good work on waste management, majorly undergoing adoption of decentralised waste treatment do not get discouraged and continue to carry on the good work. Centralised systems will not work, are not sustainable. Slaughter houses are in pathetic condition generally , the consequences definitely must be realised by each and every ULB.